Forget about motorcycling being a lads world. There are – and always have been – plenty of women riding fast and far. Here’s a look at some of the most prominent female riders past and present. Close your eyes and picture a biker. Chances are the image is rather manly. Yet women have been riding bikes ever since there were bikes to ride, and the numbers seem to be increasing. 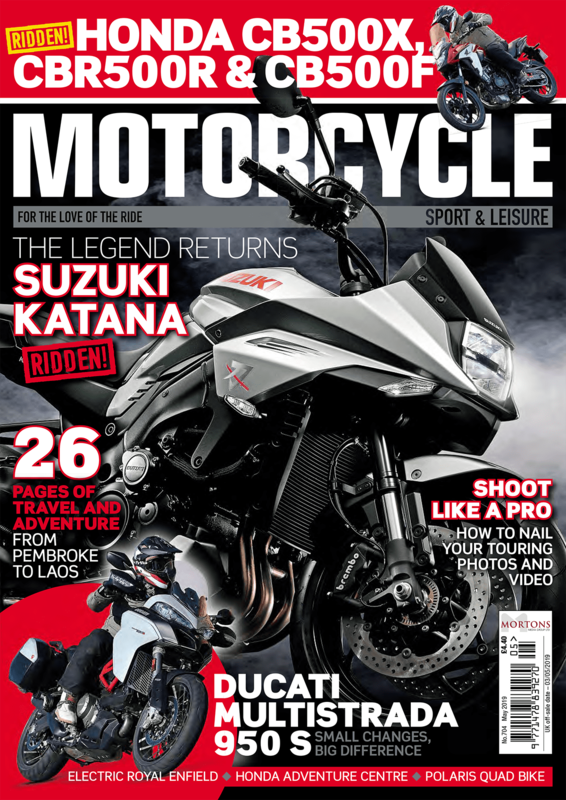 Out of around five million full motorcycle licence-holders in England, roughly 10% being women riders. Elspeth Beard returns from her ground-breaking round the world trip. Theresa Wallach was one of the trailblazers. 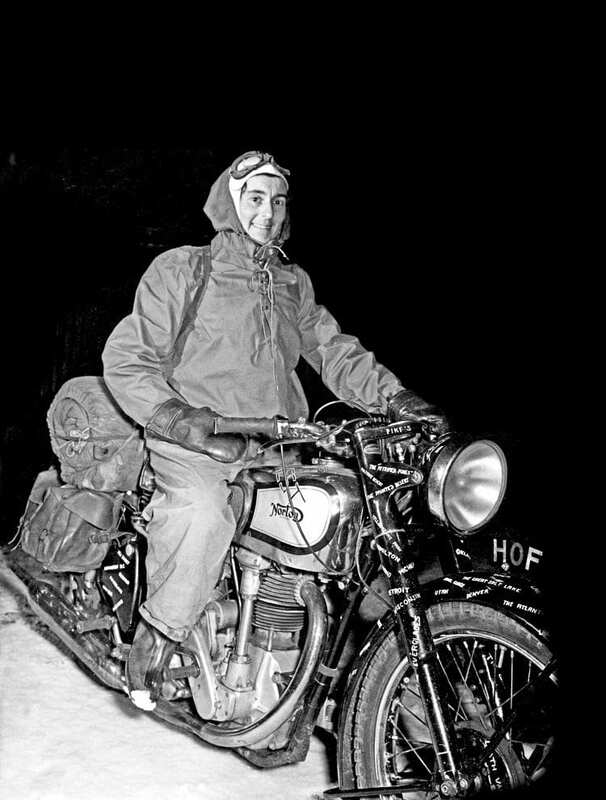 Born in London in 1909, Theresa went on to become a racer, motorcycle adventurer, military dispatch rider, engineer, author, motorcycle dealer, mechanic and riding school instructor. In 1935 Theresa and her friend, Florence Blenkiron, rode from the UK down to South Africa on a 600cc single-cylinder Panther with a Watsonian sidecar and a homemade trailer. 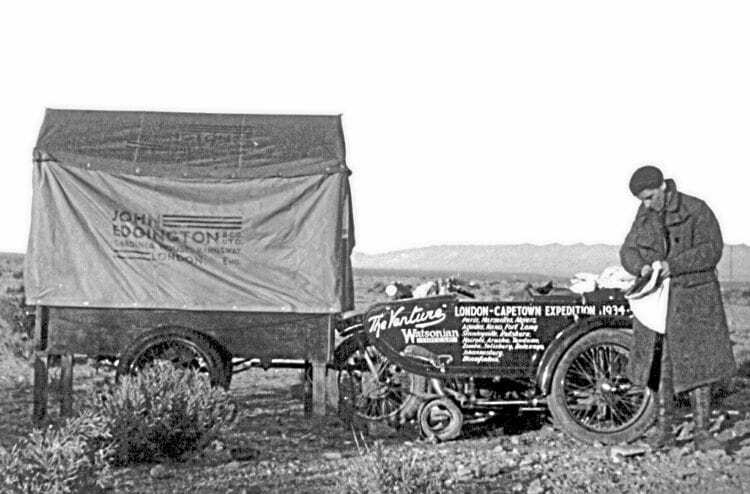 Crossing the Sahara, riding through equatorial Africa, and finally arriving in Cape Town, they managed the whole trip with no back-up – not even a compass to hand. Following the trip, Theresa wrote a book, The Rugged Road, which tells the story of their epic ride. Theresa Wallach with her sidecar in a desert en route to Cape Town. Heading, quite literally, in a different direction, Peggy Thomas from Surrey was an inspiration in the 1950s. She toured Scandinavia on her 125cc BSA Bantam, and then in 1950 headed over to Canada, the US and Mexico on the same bike. For her American trip, she brought with her a special pillion, Matelot, her Airedale terrier, who travelled in a box behind her. Peggy wrote a book about her travels under the dual title of A Ride in the Sun and Gasoline Gypsy. 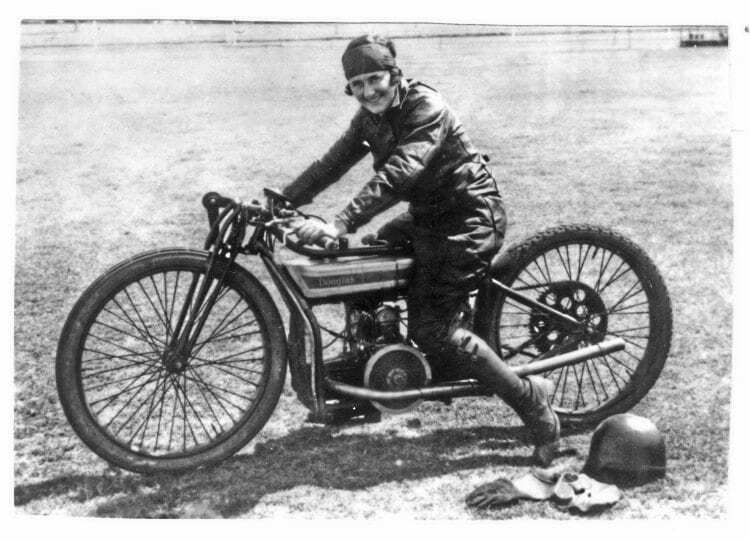 Elspeth Beard was the first English woman to ride around the world. 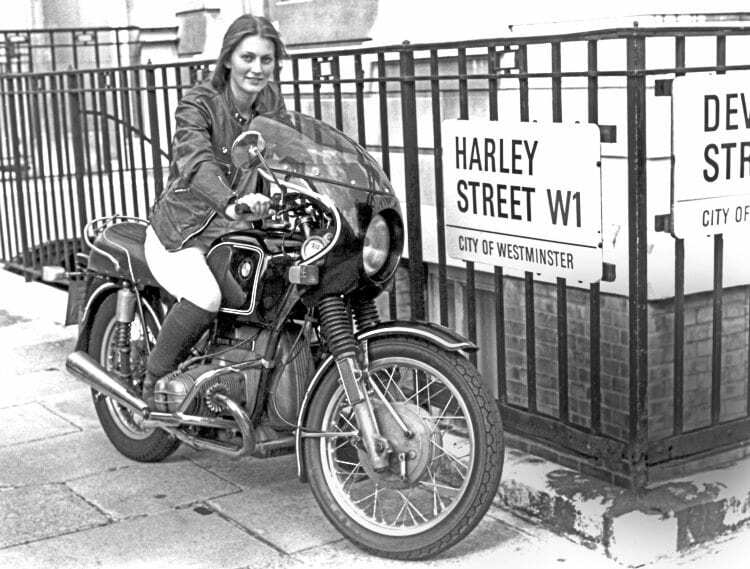 The first woman to ride around the world solo was French journalist and writer Anne-France Dautheville, who by 1973 covered 12,500 miles over three continents, riding a 125cc Kawasaki. She continued her world travels until 1981. Elspeth Beard with her fully loaded bike in India. 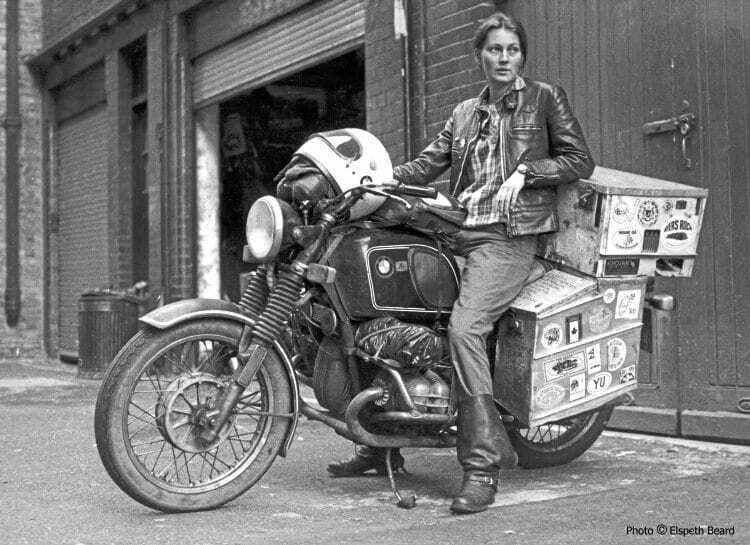 Back in England, Elspeth Beard, the first English woman to ride around the world, began her journey in 1982 on a BMW R60/6. From the UK, she shipped her bike to New York City, riding on to Canada, Mexico and Los Angeles. Then it was shipped to Sydney, and Elspeth spent a good while travelling in Australia. Next she travelled to Singapore, riding back into Europe across Asia. She arrived back in the United Kingdom in 1984, having travelled 48,000 miles. She is publishing a book, Lone Rider, about her travels, due out in July 2017. Zoe Cano with her Bonneville on the Bonneville Salt Flats. Of the current female motorcycle adventurers, we’re particularly taken with the exploits of Lois Pryce (see her profile panel) and Zoe Cano. 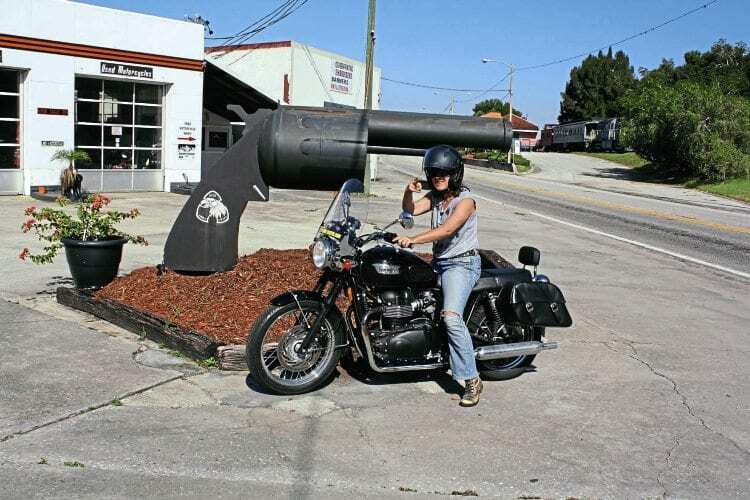 In 2012, Zoe rode solo across the American continent, without backup or sat-nay, on a classic Triumph Bonneville 860cc T100, covering over 6000 miles. This was a huge achievement considering she hadn’t done much more than 100 miles on a motorbike before setting off. In 2014 Zoe returned to America and zig-zagged along the Gulf of Mexico and Atlantic coast in Florida, through the forgotten back roads of the Florida Panhandle, Alabama and Georgia. 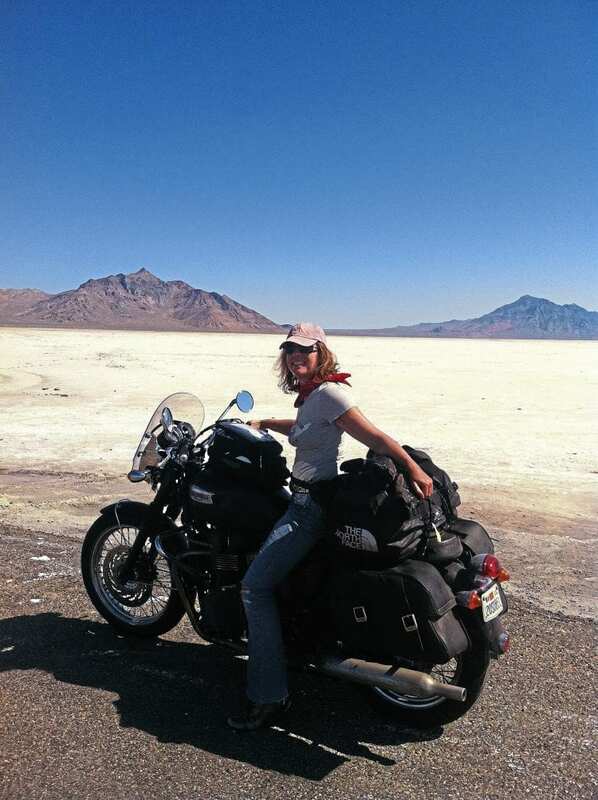 Her travels are documented in two books, Bonneville Go or Bust – On the Roads Less Travelled, covering the first trip, and Southern Escapades, charting the events of the second ride. Crossing the United States from coast to coast is still at the top of many bikers’ bucket lists, but imagine what it would have been like to make that journey over 100 years ago. The First World War was raging in Europe – although the Americans hadn’t yet joined in – and women would still not be allowed to vote in the US until 1920. Unfazed by the obstacles, in 1915 Effie Hotchkiss decided to ride the breadth of the US on an 11-F Harley-Davidson with a custom-made sidecar built to accommodate her mother Avis. They became the first women to ride across America after they completed their trip from Brooklyn, New York to San Francisco. A year later in 1916, sisters Adeline and Augusta van Buren set off from New York to the west coast to prove that women could be used as dispatch riders in the war effort. Riding Indian Power Plus motorcycles, they were reportedly the first women to navigate Pikes Peak on a motorised vehicle of any kind, and are often credited as the first women to ride solo motorcydes across the United States. They didn’t manage to change the rules about female dispatch riders, but they proved that women could do a lot more than they were given credit for at the time. Fast-forward to the inter-war years, and there was another legendary female biker in the making: Bessie Stringfield started travelling on her first motorcycle, a 1928 Indian Scout, while still in her teens, and in 1929 became the first black female to ride across the US. During the Second World War, Bessie worked as a civilian dispatch rider in the Army, and went on to found the Iron Horse Motorcycle Club. Disguised as a man, she even won a flat track race, but was denied the prize money when she took off her helmet and revealed her identity. 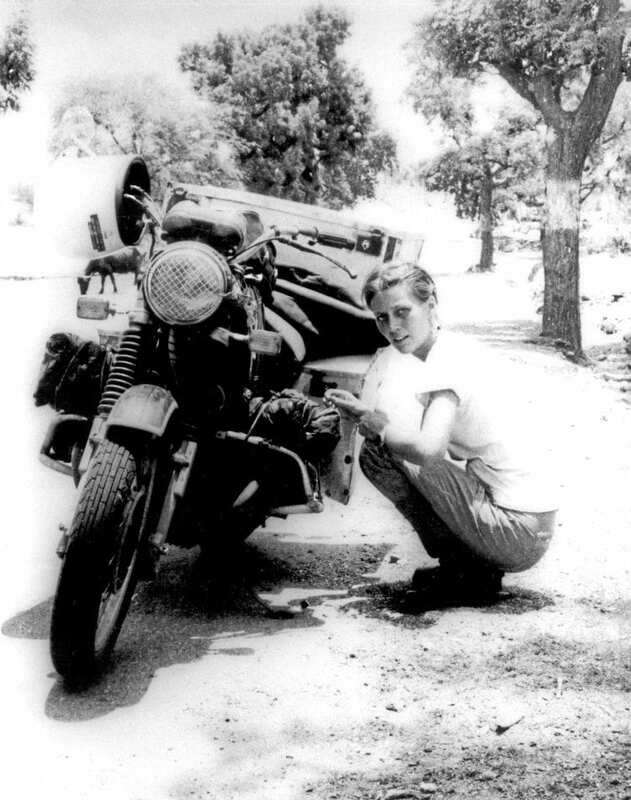 By the 1950s Louise Scherbyn helped found the Women’s International Motorcycle Association – an organisation that still exists today – in an effort to unite women riders worldwide. 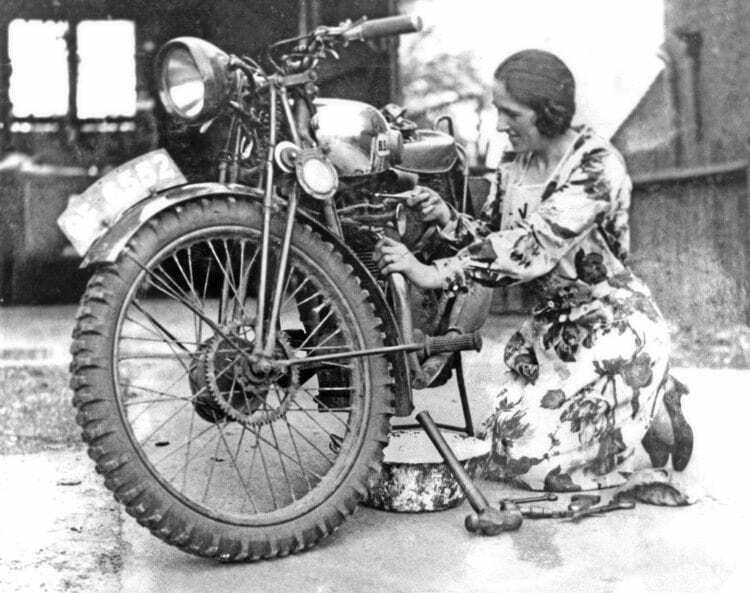 Back in the UK, Marjorie Cottle was one of Britain’s best-known motorcyclists in the 1920s, and considered to be one of the greatest trial riders in the country –male or female. She won several medals in her career, including gold at the Scottish Six Days Trial in 1923, and the Silver Vase at the International Six Days Trial in the Lake District in 1927, as part of an all-female team along with Edyth Foley and Louie McLean. In the process she became a walking advertisement for women in motorcycling. Marjorie Cottle at Scottish Six Days. Marjorie’s success had a direct impact on the rise of another female rider’s career, as Jessie Ennis (née Hole) became a New Imperial works rider in 1927. Apparently the company was specifically looking for a woman due to Marjorie’s exploits. Like all female riders of the time, Jessie struggled to gain entry to competitions that were deemed ‘too dangerous’ for women, which put her at a distinct disadvantage. She couldn’t enter races at Brooklands, for example, until there was a women’s only event, where she achieved second place. She also helped organise a ladies-only version of the Land’s End Trial to prove that women should be allowed in the main event. 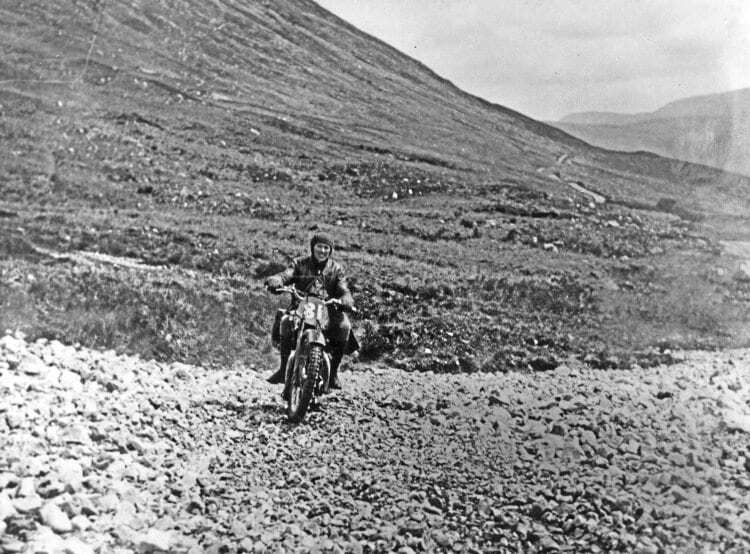 This didn’t change the organisers’ minds, but allowed Jessie to ride the iconic routes. Later on in her career she performed as a stunt rider and raised money for charity. 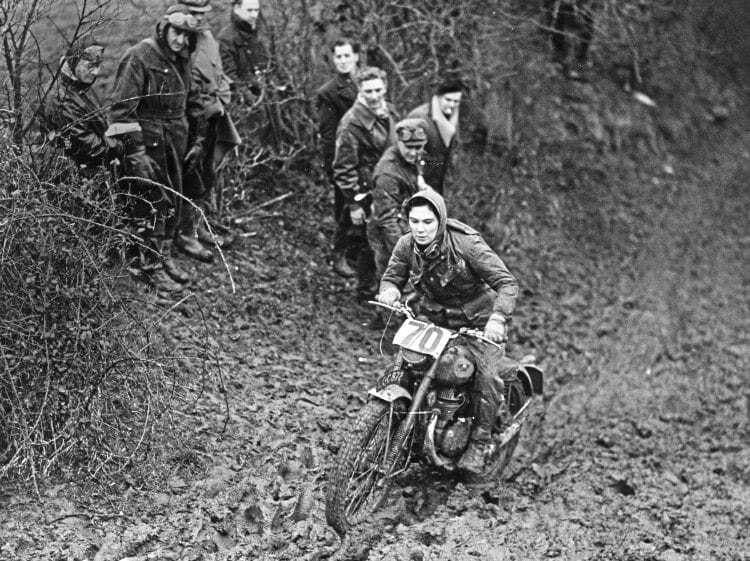 Marjorie Cottle was one of Britain’s best trials riders. With a riding career spanning trials and dirt-tracking, Irish rider Fay Taylour was a force of nature in motorsports. She first achieved fame winning the Venus Trophy at the classic Southern Scott Scramble in 1928, and then went on to compete in speedway. She won speedway races in both the UK and Australia — most notably the 1929 Cinders Trophy, before a 30,000-strong Wembley crowd. After that season women were banned from speedway, so Fay turned to racing cars, again with considerable success. During the Second World War she was interned for her fascist views, but returned to car racing after the war. Faye Taylour on her Douglas speedway twin. From the late 1940s to the early 1970s, Olga Kevelos was one of Britain’s leading female competition riders. 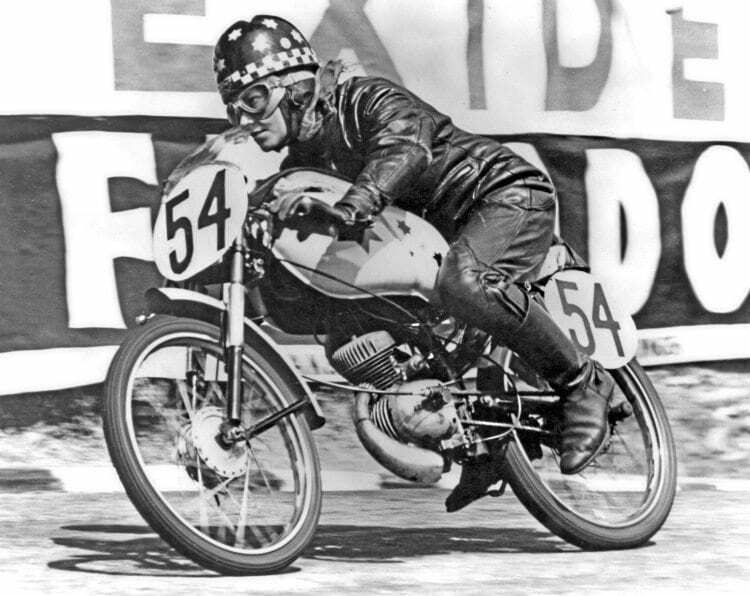 In 1949 and 1953, she bagged two gold medals in the International Six Days Trial, and competed in several races both in Britain and abroad. She also did a bit of road racing, but she’s best known for her trials and scramble riding. Olga Kevelos – one of Britain’s leading female competition riders. She might not have been the first female racer, but Beryl Swain is certainly among the most influential; in 1962 she became the first woman to compete as a solo rider at the Isle of Man TT. She finished 22nd out of 23 finishers, with an average of 48mph on her 50cc Itom. Unfortunately, the racing world was not ready for fast women back then, and banned them from riding the TT circuit until 1978. 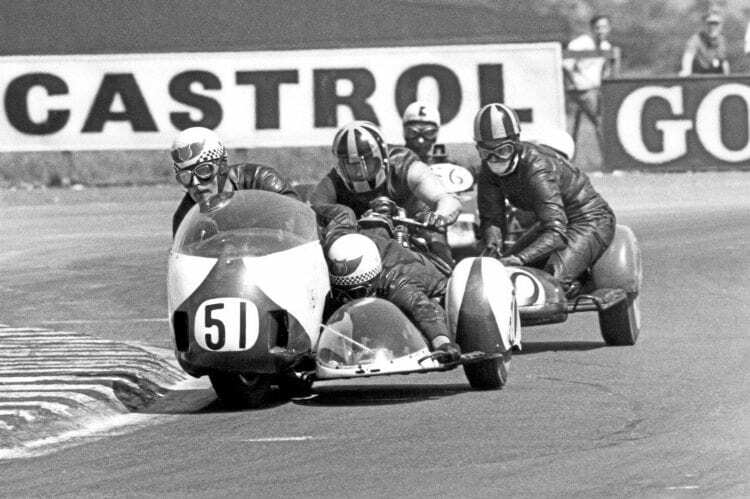 However, that didn’t stop Rose Hanks in 1968 from racing the TT as a passenger, in a sidecar outfit piloted by her brother-in-law, Norman Hanks. The pair finished in second place, making Rose the first woman to ever stand on the winners’ rostrum at the TT. Beryl Swain was the first solo woman rider of the IoM TT. When Hilary Musson managed to fight the ban on female riders and entered the TT Formula 3 in 1978, she finished 15th. Hilary’s daughter Gail carried on the family’s racing tradition, achieving – among other merits – 6th place in the 1998 Manx GP. Norman and Rose Hanks in the middle outfit (650cc BSA). Photographed at Thruxton 1970. 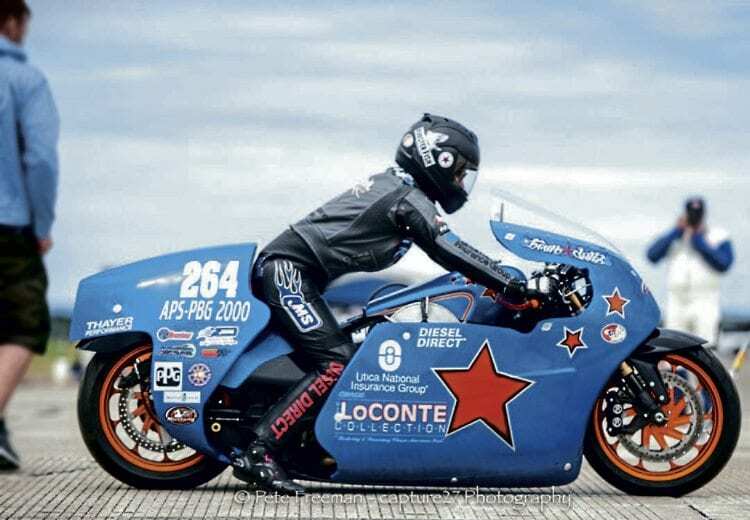 In the Junior TT of 1997, Sandra Barnett set the fastest ever lap by a woman rider at 114.63mph, on her way to 12th place. 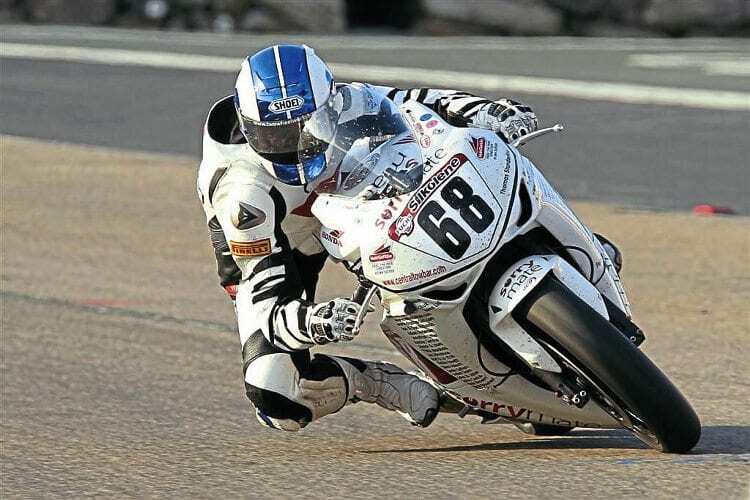 One of the best-known female racers of recent years is Maria Costello, who for five years held the Guiness World Record as the fastest woman at the Isle of Man TT, when she lapped the Mountain Course at an average of 114.73mph in 2004. She was also the first female solo rider ever to claim a podium spot on the island, taking third place in the Ultra Lightweight category of the 2005 Manx Grand Prix. Patsy Quick was the first British woman to compete in the Dakar. Away from the Tarmac, British women have also proved fast and fearless. 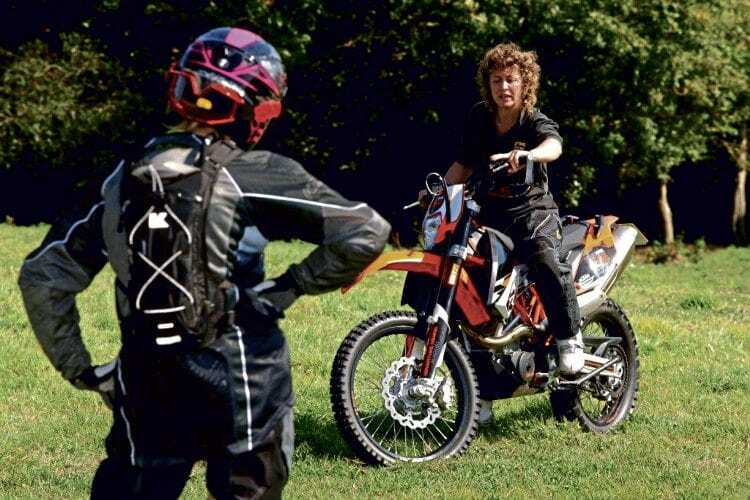 Patsy Quick was the first British woman to compete in the Dakar rally in 2003, and the first to finish the rally in 2006. Jenny is now a trained motorcycle mechanic, and a successful racer. “I love the challenge, the adrenaline buzz and the satisfaction you get from racing,” she admits. That passion has taken her from a humble start of scraping together enough money to finance racing on her own bike with tyres pinched from a scrap heap, to lining up on the British Superbike Championship grid on a factory Honda CBR1000RR Fireblade. Arguably the biggest moments in Jenny’s racing career so far were recorded on the iconic Isle of Man TT. In 2009, Jenny took to the Mountain Course as a newcomer on a bike she had never raced, and smashed Maria Costello’s previous women’s lap record with an average of 116.8mph in the senior TT. Jenny was back on the Rock in 2010, and broke her own record with a 119.945mph lap. Jenny hasn’t hung up her racing leathers yet, but at the moment she’s not quite sure what 2017 will bring in terms of racing: “Everything’s a bit up in the air at the moment. rd love to be racing if I can find enough sponsors. I’m keen to have a fun year too, so we’ll just see what happens.” Watch this space! Livia Lancelot is a professional motocross racer of ten years, and a team owner in the World and French Championships. She started riding at the age of four. Today Livia is a double World Champion, European Champion, six-times French Champion, and she has got two medals at the X-Games in the US. In addition, she’s the only woman to have ever finished in the top 20 of the MX2 class in the World Championship, and the only woman in the top 40 at the iconic Le Touquet beach race. 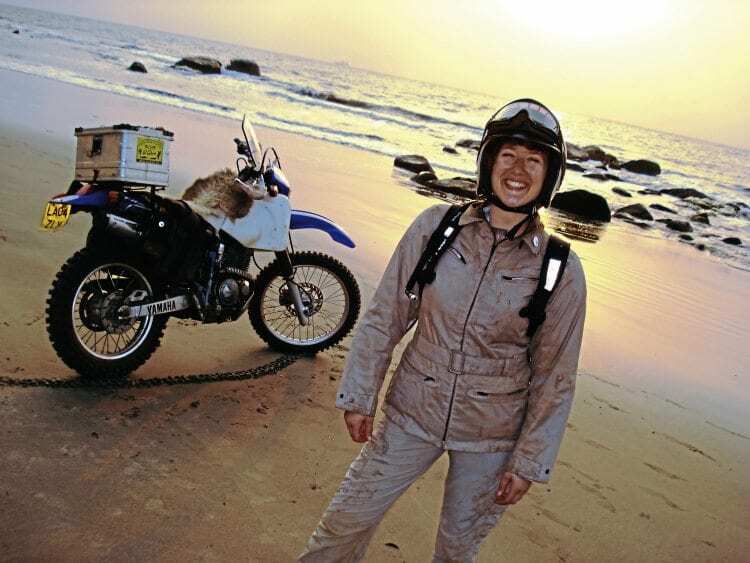 Lois Pryce is an author, journalist and world traveller who specialises in solo travel on small-capacity motorcycles. Since jumping on her first bike, a 1959 BSA Bantam D7, Lois has ridden a variety of bikes on her adventures. The first trip was a 20,000 mile ride from Alaska to Ushuaia – the southernmost town in the world, at the tip of Argentina – on a Yamaha XT225. That was followed by 10,000 miles from London to Cape Town on a Yamaha TTR250. More recently, she’s been riding in Iran on another TTR250. When Jody’s not racing her V-twin at speeds of over 200mph, she can be found custom painting motorcycles at her father’s shop, Perewitz Cycle Fab, in Halifax, Massachusetts. Jody holds 15 land-speed records. She was the first woman to ride an American motorcycle over 200mph, and the first female on a V-twin to get into the Bonneville Salt Flats 200mph club. Jody’s race bike, the ‘264’, is a fully custom-built 1966cc V-twin, with peak power of over 315bhp and 295ft-lb of torque. Her current record on the bike is 208mph, but she’s aiming even higher. The recipe for her success in a high-testosterone environment is simple; “I believe that a lot of my success comes from absolutely loving motorcycles. And having a cool dad who let me do whatever the ‘guys’ were doing. Women are becoming more and more accepted, and I try to encourage them to keep going. Previous Post:MSL September 2018 out now!